Our congratulations go to Catriona Matthew in being named as captain of the European team to meet the USA at Gleneagles in September 2019. A hard earned and well deserved appointment. 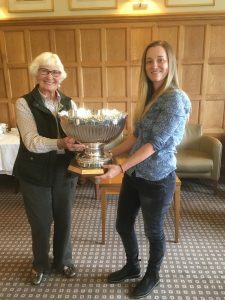 Catriona has appeared in the Solheim Cup teams since 1998 and having been called in as a reserve this year, much to the delight of East Lothian, she went on to win 3 points from four matches. We wish Catriona well for her preparations for the event and success when the time comes. I am sure there will be a larger than usual contingent from East Lothian at this Solheim Cup. 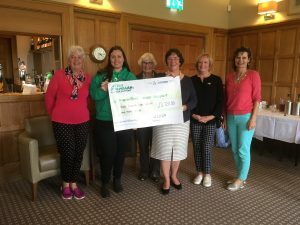 The Babe Zaharias committee, volunteers from the day, Trophy winners and a representative of Macmillan met at Gullane on Sunday for a small presentation. 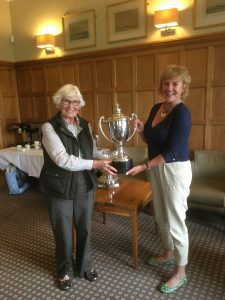 The Babe Zaharias Trophy was formally presented by Janette Buchanan our President to Alison McBride from Harburn and the Ultraplast Handicap Trophy to Vicki Cullen from Murrayfield. 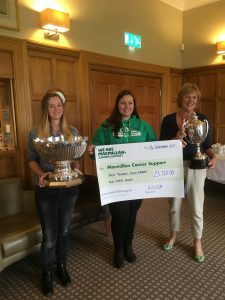 A cheque for £3,720 was then presented to Pauline Macmillan from Macmllan Cancer Support. The competition rules are in the rules section of the website if you have any queries. I hope that you will all have an enjoyable winter golfing season and that the weather will be kind to you. 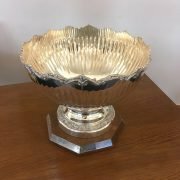 The Ladies British Amateur Stroke Play Championship was played at North Berwick earlier this month. There was sadly a shortage of East Lothian talent with Dawn Young the sole East Lothian player. Clara Young like so many of of the top young players had already returned to college and were unavailable. Conditions were difficult but Linn Grant was a worthy winner with a score of -4 over the four rounds. The finals of the Commonwealth Spoons were held at Alyth on Monday. ELLCGA was represented by five couples but sadly the Spoons have gone south to Dumfries and not to East Lothian. The course was in great condition but with not much run after so much rain and we all seemed to struggle with the greens and at times with a testing wind funnelling down between the trees. The finals of the Stephen Gallacher Foundation were held last weekend at Kingsfield GC and Ala Gorka scored a great 42 points in the under 14 girls section. This left her after a play off in 2nd place. Ala also finished 2nd in the under 14g girl’s order of merit despite being unable to play in a number of competitions. Ala has cut her handicap from 16 to 10.7 this year. Well done Ala.
A reminder that this event is being played at Royal Burgess on Sunday 15th October. The closing date is Monday 26th September so get your entry in soon if you want to play.